Bus from Johor Bahru to Shah Alam is gaining popularity because of the direct service. 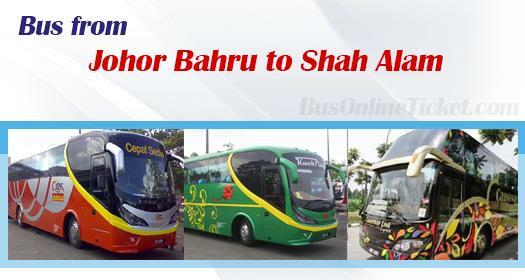 Last time, commuters going to Shah Alam would have to take bus from Johor Bahru to Kuala Lumpur, and then transfer city bus from Kuala Lumpur to Shah Alam. By taking the direct bus from Johor Bahru to Shah Alam now, passengers save the time from having transit in KL. Operators who Supply Bus from Johor Bahru to Shah Alam? Numbers of operators supply the service from Johor Bahru to Shah Alam. CityHoliday Express and Kwok Ping are the largest operators who provide frequent bus from Johor Bahru to Shah Alam. Besides that, Maju Express, Eagle Experss and Causeway Link are the other famous operators who supply the service, but with lesser trips. Kwok Ping under the management of Agent JB Transliner provides additional boarding points besides Larkin Bus Terminal. Kwok Ping's the other two pick up points are satellite bus terminal located in Johor Bahru neighbourhood area. The two satellite bus terminals, namely Johor Jaya Bus Terminal and Tun Aminah Bus Terminal, offer convenient boarding service to passengers. Duration for bus from Johor Bahru to Shah Alam takes about 4 hours with 1 stopover for toilet break. The bus fare for bus from Johor Bahru to Shah Alam is in the range of RM 36.00 – RM 42.00. During festive season like Chinese New Year or Hari Raya, bus fare adjust upward slightly. All coaches from Johor Bahru to Shah Alam terminate at Shah Alam Bus Terminal located Shah Alam Seksyen 13. Booking JB to Shah Alam bus ticket with BusOnlineTicket.com is secure and simple. So long you have the internet access, you could make online booking with BusOnlineTicket.com anywhere under the sun. You not only can book ticket for bus from Johor Bahru to Shah Alam, but also other bus ticket within Malaysia.